Business and busyness as usual in the kitchen today. We are very excited because King Hock's cousin and younger sister are coming to visit. The hoopla of cooking for any guest is always a treat, but cooking for King Hock's cousin is a huge treat. You see, she is vegan and gluten free. I love coming up with things to make for her, it's a fun excercise for my brain. 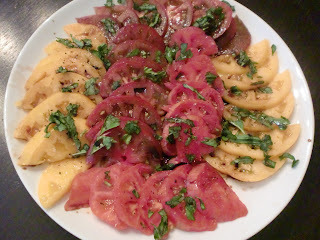 Heirloom tomatoes are phenomenal, beautiful, and are at their peak this very moment. I have fun picking out the tomatoes whenever I make this. I try to buy an assortment of colors, shapes, and sizes. This is such an easy thing to make, and it is very refreshing when it is in the triple digits outside. Don't make this until right before serving. Arrange the tomatoes on a large serving platter in lines of colors. Drizzle on the olive oil and the balsamic vinegar. Sprinkle with salt and pepper. Sprinkle on the fresh basil. The last time KH's cousin visited I made cauliflower, that she absolutely loved. I can't wait to introduce her to this recipe. 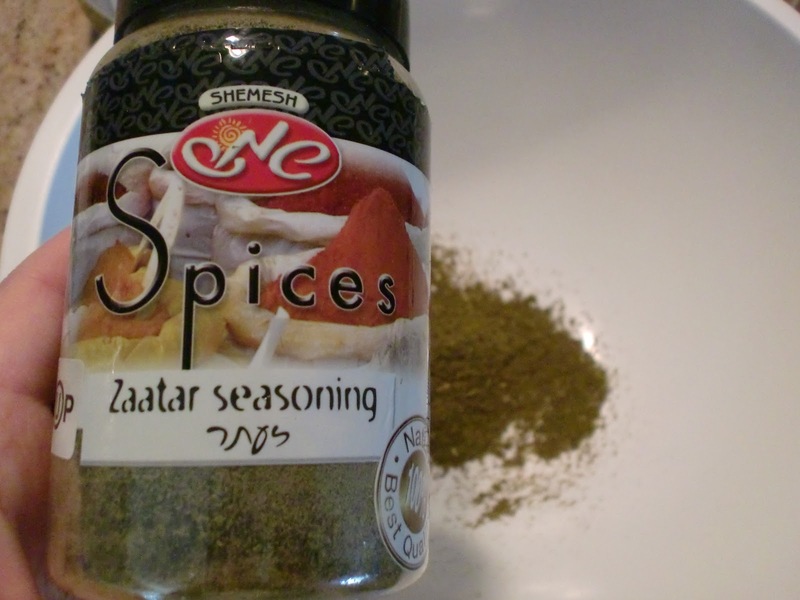 Za'atar seasoning can be found in Israeli supermarkets or in some kosher sections of the grocery store. It is delicious sprinkled on hummus too. This recipe is from Susie Fishbein's latest for teens and 20-somethings. Place an empty sheet pan in the oven. Turn the oven 450 degree, and heat the pan as the oven heats. In a large bowl, stir together the olive oil, za'atar spice, vegetable broth, and garlic. Add the cauliflower florets and toss to evenly coat. Remove the hot sheet pan from the oven and pour the cauliflower on into a single layer. Use an oven mitt and place the sheet pan back into the oven immediately. Roast, uncovered for 30-40 minutes, until nicely browned. Anthony Bourdain had posted a similar recipe online, here is my spin. 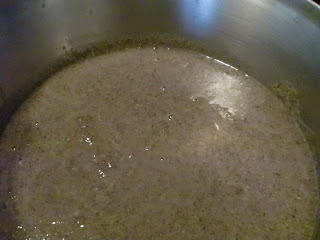 Melt the 2 T. of the margarine and the olive oil in a soup pot over medium heat. Add the onions and sautee until translucent and soft. Add the mushrooms and the rest of the 2 T. margarine. Cook stirring occasionally for 8-10 minutes, until the mushrooms start to soften. Add the broth and bring to a boil, turn down to a simmer. Let simmer for 1 hour. Use an immersion blender and blend until smooth. Add salt and pepper to taste. I usually add a bit, and then taste and keep adding and tasting (with several spoons) until the saltiness I like is achieved. Stir in the white wine. Thinly slice the 2 mushrooms you have set aside. Ladle the soup into the bowls, and sprinkle with a few fresh mushroom slices. That is just our dinner. I'll let you use your imagination as to what I'm making for breakfast and lunch tomorrow. I hope you have a good shabbat and weekend.